Yesterday, we paused to honor those who have served our country by making the ultimate sacrifice. We also celebrated the military personnel who have served in recent conflicts and those who continue to protect us as enlisted members. Unfortunately, too many of these American heroes are returning home unable to find employment to provide for themselves and their families. One company is working to change that: Schneider National, one of the nation’s largest trucking companies and longtime supporter of the U.S. Armed Forces, has pledged to hire 650 people with military backgrounds by the end of 2012. Schneider’s award-winning military recruitment program and strong reputation as a military-friendly employer recently helped garner a very special invitation. 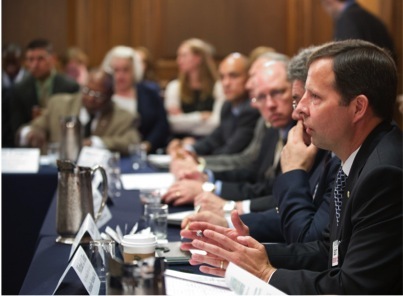 Attached please find a photo of the company’s vice president of driver recruiting, Mike Hinz, participating in a May 9 meeting of the Senate Democratic Steering and Outreach Committee, held in Washington, D.C.
(Pictured above): Mike Hinz of Schneider National participated in a roundtable discussion with leaders of veterans service organizations, local/national businesses and members of the Senate Democratic Steering and Outreach Committee in Washington, D.C earlier this month regarding veterans employment opportunities and issues. Hinz stressed the need to simplify and expedite processes that allow veterans to transition into work quickly and easily, and discussed how the trucking industry is ready to immediately put veterans to work.